Books for Babes provides info on the sort of comics that can be enjoyed by children and adults alike. This week we recommend the remastered edition of ‘Fran of the Floods’, available March 21 from Rebellion Publishing. by Stefania Rudd. It’s incredible to think that when Fran of the Floods was originally published its themes of environmental awareness would resonate even more now than it might have in 1976. Climate change and how it’s impacting the world is a very real worry for us today, but the conversation surrounding it is one that’s been an essential part of our discourse for generations. Rebellion Publishing seems to think so, too. 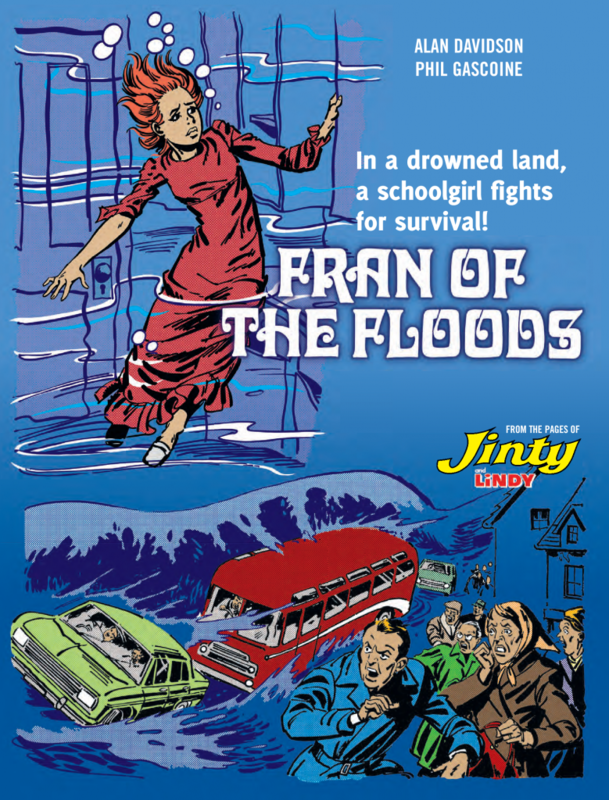 Fran of the Floods was serialized in a publication called Jinty, a weekly British comic aimed at a teenage female readership. It’s seeing a timely revival of sorts in 2019, with a brand new collection from Rebellion hitting UK shops in March. Reading through this new collection, it occurred to me that the dystopic environmental horror tale contained within shared parallels with our very own reality. Its stark black and white pages, featuring massive floods and other weather-related calamities, resembled the real-world news footage we see from Southern US coasts with alarming regularity. I wept for our futures and turned the page. Keep calm and carry on, right? When it comes to stories that seem to declare the end-of-days, I don’t do so well. I know exactly where I’ll be when the apocalypse happens, and let me tell you, I’m not gonna make it. However, Fran Scott, the book’s eponymous teenage schoolgirl, will be just fine. Thrust into the midst of an environmental catastrophe Fran is all determination, and she has a sharp wit, as well. Two skills that are absolutely necessary to survive this sort of danger, yes, but in Fran of the Floods these qualities make Fran an engaging character. “The sun is giving an extra flicker of warmth—and on Earth there is sultry heat, continuous rain, and flooding…” This phrase (or a slight variation of it) prefaced each 3-page section of the book. Since Fran of the Floods was spread out over the good part of a year, a reminder like this was essential; it cast a consistent mood over the series and must have served as an effective grabber (and refresher) for readers who leafed through Jinty all those years ago. Writer Alan Davidson had a lot of story to tell, and was terrific about keeping things moving in lock-step with every hardship Fran faced. Immediacy was the name of the game, and Davidson’s flow of dialogue moved as quickly as the rushing waters taking over the land. Davidson placed Fran in many high stakes situations where she had to keep her cool and react logically or else it might have resulted in her unceremonious end. When we read Fran of the Floods today, Davidson’s characterization of Fran is refreshing; whether we find her escaping a group known as the Black Circle (who wants to enslave her and her friend, Jill), or deciding to care for an abandoned child and her pet rabbit, Fran always finds a way to survive—a strong female character set in the midst of insane times. The story can often take dark turns, but Fran of the Floods never completely submits to it (thank goodness!). Ultimately, Fran’s constant resolve and inner strength gives her story a big bright boost. Phil Gascoine’s artwork reflects that. Each page is packed with anywhere from 8 to 10 panels, and at first this can visually overwhelm you. This reproduction presents Fran in black and white (the original printing used hues of blue), which makes every detail stand out even more thanks to Gascoine’s efforts. 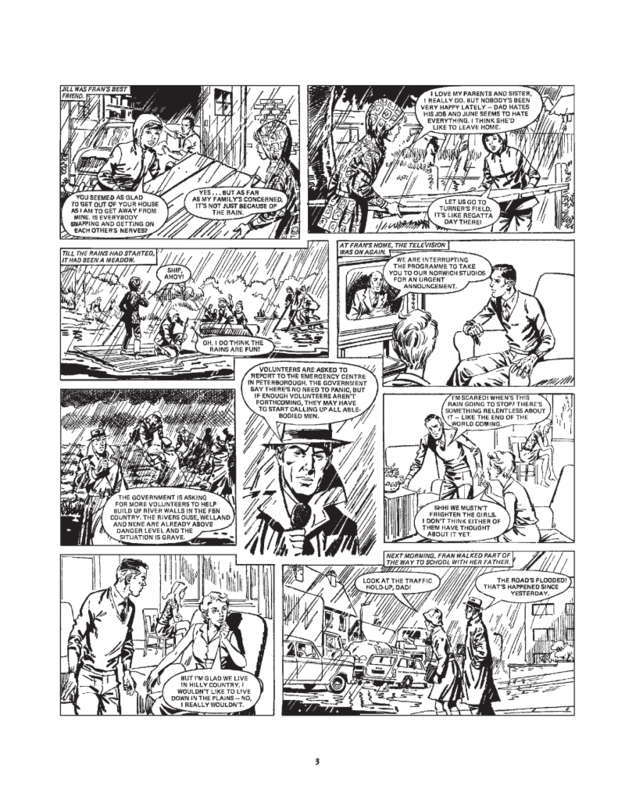 With so much story to convey in a mere three pages (published every week, no less! ), his pacing and illustrated physicality lent Fran a visual shorthand towards the greater meaning just underneath the inks. Gascoine was especially masterful with mood; to see a ceaseless deluge conveyed in such a way it’s easy to feel a sense of panic with each subsequent chapter. This and other stories from the Jinty catalog focused on relatable teens going through their everyday lives when suddenly, BAM!—their worlds are interrupted by alien abductions, the effects of witchcraft, or natural disasters. The same fodder you’ll find in today’s YA offerings. Fran of the Floods is definitely a throwback in terms of presentation and overall aesthetic, but its environment-conscious heart is just as topical as ever. 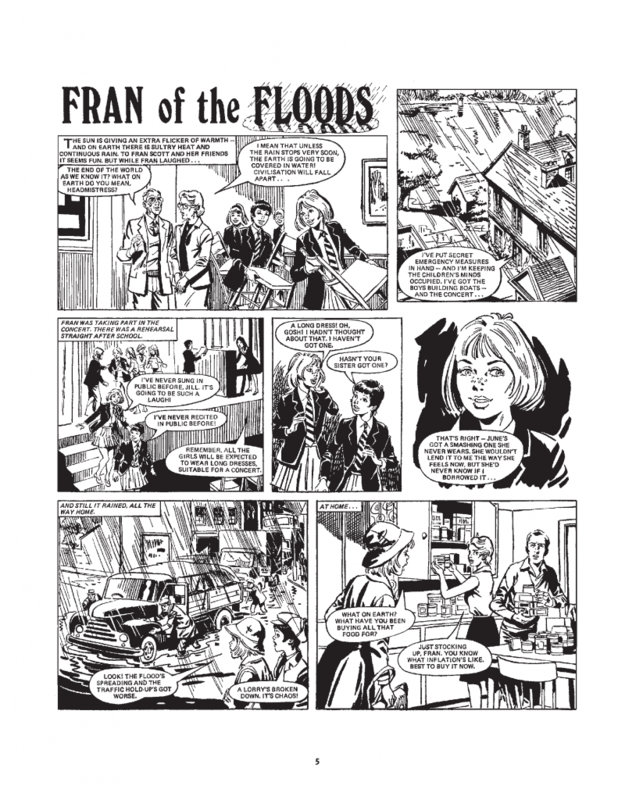 It’s in this respect that Fran of the Floods feels especially prescient; it allows a generation of young readers the opportunity to reflect on what they might do in these sort of circumstances, the kind that don’t seem as fantastic as they might have over 40 years ago. It’s a chance to imagine themselves as the impetus for change in this world, even if the older people around them keep insisting that they aren’t capable of it. This book contains a dystopian future and all that comes with it: death, catastrophe, general horribleness. 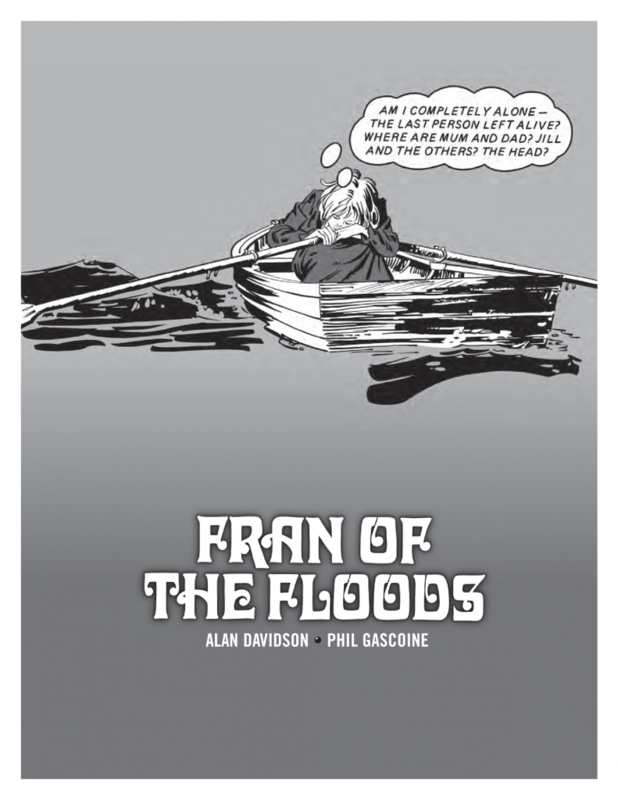 ‘Fran of the Floods’ will be available to order from your local comic store, and the 2000 AD shop, on March 21. 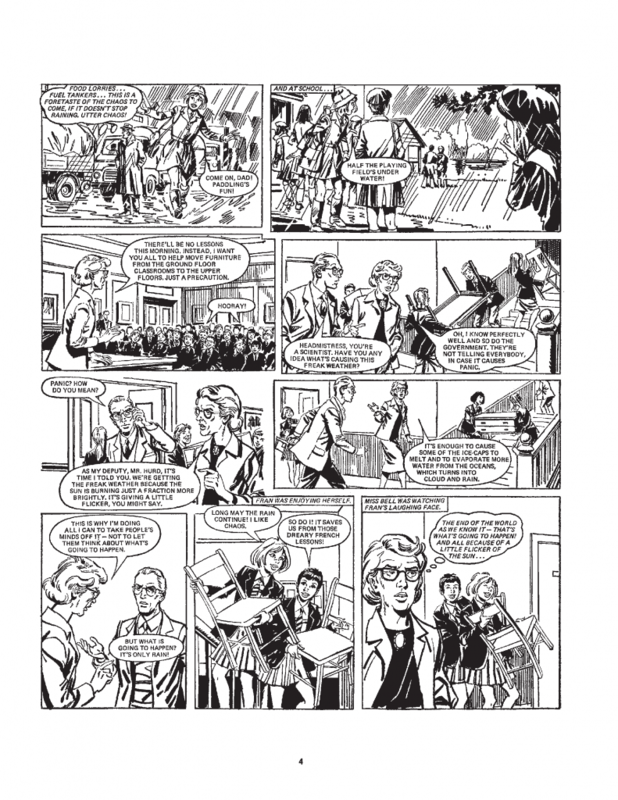 Enjoy this six-page preview of ‘Fran of the Floods’, courtesy of Rebellion Publishing!